Ben's kit has the same plane of motion as Neil's current set-up, and has the basic NEP cymbal configurations (ride, china, crash). 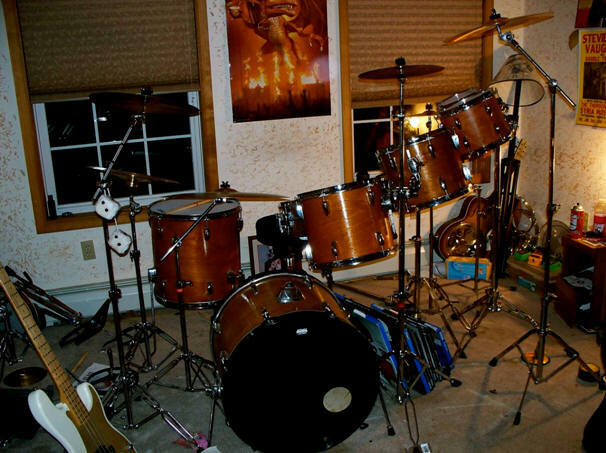 The dice hanging from the crash cymbal stand are a nice touch, too! By the way, Ben is one of the lucky people who saw Rush on the Fly By Night tour. This is my Tama custom kit. I'm not sure what year or anything. I saw Rush for the first time on the Fly By Night tour and have seen them on almost every tour since then. I have been mesmerized by Neil's playing and set up. The set up includes a 14" steel snare with an Evans EC2 reverse dot snare head. I also use a wood 10" DW snare, which is not shown. The tom sizes are, 8", 10", 12", 13", and 16" floor tom. The bass drum is 22". All tom heads have Evans G2 coated heads on the top, and Evans EC reso heads on bottom. The cymbals are Paiste signature in sizes: 18" crash, 15" crash, 16" crash, 22" ride, 16" China, 14" hi-hats, and 8" and 10" splash.